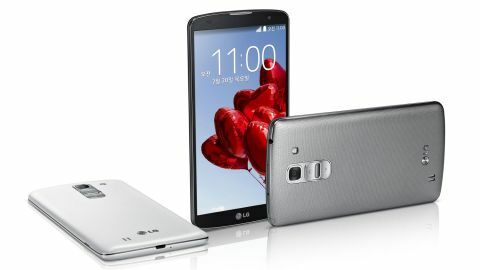 Has LG managed to make a fab phablet? Big is beautiful, or at least that appears to be the case in the smartphone market as every manufacturer seems to be pushing supersized devices on us at a rate of knots, and the LG G Pro 2 is no exception. The main feature on the G Pro 2 is its 5.9-inch full HD display, making it bigger than the phablet of choice, the Samsung Galaxy Note 3, but smaller than HTC One Max and the huge Sony Xperia Z Ultra. There's currently no word on price (spoiler: it won't be cheap) or whether the G Pro 2 will actually make it out of Asia, but we're keeping our fingers crossed that it will considering the success of Samsung's Note series. As well as the big screen the G Pro 2 also has some other decent specs, including the 2.26GHz quad-core processor it's borrowed from the LG G2, 3GB of RAM, 16/32GB of internal storage and the latest version of Google's mobile platform, Android 4.4 KitKat. LG has stuck its own overlay on top of KitKat, but it's a relatively inoffensive offering adding some useful extra features to the handset. The main addition is Mini View - a feature which sees the phone's screen shrink and shift to one side of the display, making it easier to use the G Pro 2 with one hand. A quick swipe either left or right across the navigation bar and the screen minimises into a smaller area, allowing your thumb to reach all areas - you can even adjust the size of the Mini View window to suit your digits. You can still see the faded full size operating system running in the area of the screen which isn't taken up by Mini View. Impressively there was no lag experienced during my play with Mini View, which is surprising as the G Pro 2 was rendering the same thing twice - once in Mini View and once in the full size faded area. I can see this being a very useful feature and it trumps other phablets which may provide a keyboard floated left or right, but none shrink the whole user interface like the G Pro 2. That said, those with smaller hands will still struggle with the G Pro 2 as there's no getting away from the fact that it's a big handset and more often than not you'll probably want to use both mitts to steady the ship. As with the G2 Mini, the G Pro 2 has inherited the rear volume and power/lock keys from the G2, and they are still pretty tricky to hit, especially here as you need to shuffle the phone slightly to get your fingers in the right place. LG does offer a solution to this issue with its Knockon screen wake function, allowing you to wake up and lock the handset with a double tap of the screen (or notification bar if you want to lock it). The G Pro 2 takes things a step further though with Knockcode, allowing you to not only wake the screen by tapping it, but also unlock the handset in just a few finger presses. Knockcode requires you to tap out a pattern of between 2 and 8 knocks in length, reducing your reliance on the rear keys while also improving security on your device. I did find that the G Pro 2 didn't always register my knocks, which forced me at times to have two or three attempts at unlocking the smartphone. These errors could well fade with time as you adapt to the new functionality, or the system may be a little flawed. You'll have to wait until the in-depth LG G Pro 2 review to find out the answer to that one. Even though the LG G Pro 2 is all plastic it still has a premium look and feel to it, although it's never going to match the all metal body of the One Max. The metal mesh pattern applied to the rear of the G Pro 2 does provide some much needed grip, ensuring you have a tight grip of the mammoth mobile. The screen is bright and full of detail, making text easy to read and videos standout - this is a device you could easily watch a movie on, or play some intense Real Racing 3. There wasn't a moment when the G Pro 2 appeared to struggle and it still performed perfectly when I opened up pretty much every app on it. This performance also finds its way into the web browsing, loading mobile sites in a flash, while content heavy desktop websites appeared in just a few seconds over a decent Wi-Fi connection. You can also split the browser into two windows - with each taking up half the screen - in much the same way as Multi-Window does on the Galaxy Note 3, allowing you to view two websites at the same time. This function isn't available with any other applications and I struggle to see the real appeal of this particular feature. When held in two hands the G Pro 2 is easy to type on, if not a little top heavy, and if you've only got one hand free Mini View provides a handy way of tapping out a missive with relative ease. LG has done a lot of work on the G Pro 2's 13MP rear camera, which not only features the firm's new OIS+ (optical image stabilisation) technology, but also allows you to record in Ultra HD 4K quality. If slow motion is more your thing then you can also record at 120fps with a full HD resolution, and the G Pro 2 will give you three slow motion speeds to choose from in post-production. The new OIS+ tech means images will still come out crisp and clear even if you're on a bumpy bus ride, or just walking down the street. It also allows for better low light images, although I was unable to put this to the test in the brightly light demo area. A clever camera feature you'll find on the LG G Pro 2 is something called "Magic Focus", which allows you to choose the depth of focus after taking a picture. Want to focus on something in the foreground? No problem, just use the slider on screen to ensure the object in question is in focus, while the rest of the image is blurred. For all you selfie fans out there the G Pro 2 also has you covered, with a smaller viewfinder on screen when using the front facing camera allowing for a bright background to illuminate your face - smashing. The LG G Pro 2 is a decent supersized smartphone and if it does manage to make it out of Asia then it will give the current crop of phablets a real run for their money. The various camera enhancements will attract a certain crowd, while we could see the innovative Mini View crop up on rival devices as manufacturers look to squeeze every last bit of usability from their smartphones. The LG G Pro 2 is definitely one to watch, and one to hope for.